One particular moment of Le Tour I try not to miss is the daily 4-minute segment preceding the race, which is dedicated to the food and specialties of the regions traversed by the Tour riders every day day: “Taste le Tour“, presented by French chef legend Gabriel Gaté. Gabriel has been producing and presenting “Taste Le Tour” for the past 9 years and has become a much-loved fixture of the race. 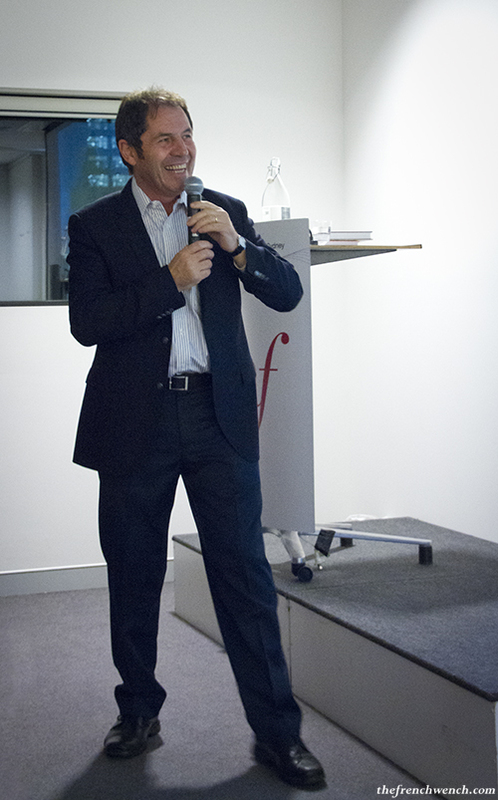 Last week, Gabriel was in Sydney to give a talk at the Alliance Française about the show and his new book, “A Cook’s Tour of France“, where all the recipes from the past 4 years of the show have been gathered and beautifully illustrated with pictures of French regions. 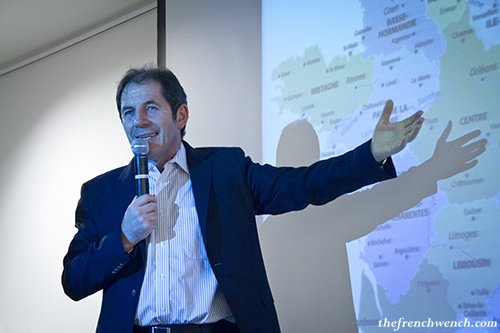 Thanks to Olivia from the Alliance Française, I had the opportunity to interview Gabriel Gaté before his talk. I even had him sign my copy of his very first cookbook that I had salvaged one rainy day on the street! Here’s a (slightly edited) account of the interview with Gabriel Gaté…..
FW (me): How has “Taste le Tour” started? We did a pilot, they liked it, and we have improved it really dramatically since that time because at the beginning, we were actually producing it from Australia. We had someone talking about cheese, I was talking about the food, I had other chefs helping me from different regions, we had a Sommelier talking about the wines. And now the budget is large enough to go and film some “vignettes”, postcards in all of the regions where the Tour de France goes every year. FW: Are you surprised by how enthusiastic the Australian public is with the Tour itself and “Taste le Tour”? GG: Yes I am surprised. I think it’s a question of timing. You can see there’s a big love for cycling. They say cycling is the new golf. If you are a young person, and you want to do exercise, a lot of people will do cycling now, because you can go to work, you can do it at the week-end, it takes you out, it’s not too difficult. With that came the enthusiasm for the Tour de France. Quite a number of Australians have been doing very well over the years, there has been some champions who have got green jersey, and with Cadell Evans of course winning the Tour 2-3 years ago was just wonderful for us, it really helped us. And of course, Australians love French food, they love French wines, they love our pâtisserie, the bread… all the good things! FW: Do you still get as excited to go back every year? GG: Absolutely! Because each time the route is different, every year it starts from a different region. This year has been super exciting, because starting from Corsica, it’s kind of a different cuisine, it’s a Mediterranean island, with specific specialties and the charcuterie, the cheeses, the seafood, with a culture that is French, Italian, Mediterranean… We spent a lot of time in Provence this year, it’s really interesting, the South of France is colourful. It’s not just about recipes, it’s about visiting markets, it’s about meeting some of the top chefs, meeting cheesemakers, vignerons and a lot more. Every year, it’s part of my evolution, I learn so much, that’s what is exciting! FW: What was the highlight of this year, beside Corsica? GG: It was really special to be able to spend time with Paul Bocuse. Paul Bocuse is a super French chef, he’s 87, he’s a Master, I have admired him all my life as a chef (I’ve been a chef for 42 years), and all my life I’ve seen Paul Bocuse as someone extraordinary. So it was really special (I’ve met him before) to be able to spend 2 ½ hours in the kitchen in the restaurant during the service so we could film what was going on for a long time, we were able to have lots of footage and to sit down with him and talk to him about his philosophy and his career, so that was a big highlight. FW: Does he still go in the kitchen? GG: He lives in the restaurant, he was born on top of the house, it’s like a family house, a big bourgeois house, so it is his place. Every day (and he’s there most of the time now because he doesn’t travel so much), he puts his chef jacket on, of course he’s not doing the cooking, he’s not chopping the onions, of course not! It’s a different level of cooking, you have got great chefs to do that. In the kitchen there were maybe 30 chefs! [..] But he’s certainly the master behind the scenes, you can see the respect that everybody has got for him. FW: You met Philippe Rigollot in Annecy, who is a MOF, one of France’s best pastry chefs. What do you think of pastry in Australia? GG: Australia is not quite at the same level as in Europe, but there has been enormous improvement. Even when I was a young chef, it was the moment of the Nouvelle Cuisine, it took a while for pastry to get to the next stage of creativity. Pâtisserie was a bit slower than cuisine at being creative. The pastry chefs were doing the Bavarois, the Mille-feuilles, the Eclairs, Croissants, but now they are really creative, because of the techniques, the technology, there has been a lot of improvement. Philippe Rigollot welcomed us in his kitchen in Annecy: he’s a great man, lovely man, he’s very friendly, he’s very encouraging to his staff, and he’s an artist… he’s a great pastry chef. FW: Restaurants in France will soon be required to indicate on their menu which items are “Fait maison” (home-made), as a third of the restaurants use industrial food that they reheat and serve to the customers: do you think the restaurant food in France is declining? GG: No I think the level is increasing all the time, at the top level, seriously, because of the technique, because of the evolution, you can see the chefs now doing a beautiful cuisine that’s really healthy. We went to Gérald Passédat in Marseille, a three-star chef who wants his cooking to be digestible, to be good for people, he wants to keep the goodness, it’s a pure cuisine… He uses olive oil, spices and herbs, and the freshness of ingredients, and beautiful techniques, he’s also a master in his cooking. He’s in Marseille, so it’s easier to do that than if you were in Normandy, but he doesn’t use butter and cream, that is not to say that butter and cream are not good, but it’s the kind of evolution that you can see. There are more and more dedicated artisans, more and more people doing really beautiful things with organic, biodynamic, you’ve got the modern techniques of preserving the raw milk. I’ve seen people in markets, for example in St-Girons in the Pyrénées, where there’s a lady that I’ve met now 2-3 times over the years, who sells raw milk: she used to have a bucket with a lid, now she has got a stainless steel vat, it’s refrigerated, she has a tap so she doesn’t touch the milk… If you want it, it’s possible to keep tradition and become modern. At the same time, remember it’s the same everywhere in the world: when we are talking about really good cuisine and the top [restaurants], it’s only like 5-10%, so I’m not surprised that a large number of restaurants in France are using industrial products. Some of them are not too bad, you know, a chef in a restaurant that doesn’t charge much money is not going to start making fresh pastry and fresh ice-cream everyday, he might even buy vegetable that are pre-cut, that’s possible, just to save time and to save on salary. But in the top-top restaurants, the level is more and more beautiful, the chefs are clever, they are more educated. FW: Raw milk cheese is forbidden in Australia and we envy France for the variety of their cheeses, but raw milk and small artisan cheeses in France are also threatened by big industrial groups and tough EU regulations. 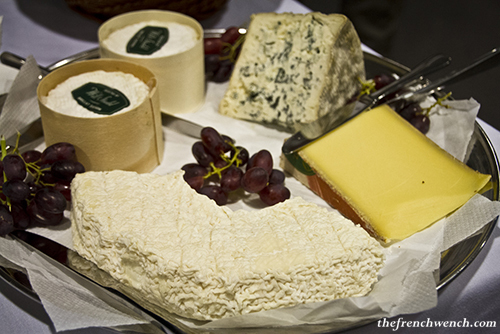 Do you think artisan cheese will survive in France? GG: Yes, I think it will survive. It’s a question of dedication, you need to be dedicated to get up in the morning. We visited a place not far from Annecy, a couple that makes Reblochon in a beautiful little farm. They have a place to make cheese in winter and a place in summer, because in summer they take the animals up the mountain where there is fresh grass, that’s a tradition. They have got two farms, and they move the whole family; they milk morning and evening, and make cheese morning and evening, 7 days a week. Now if you want a day off, you can’t ask a neighbour, he might not know how to do it. It’s really difficult. 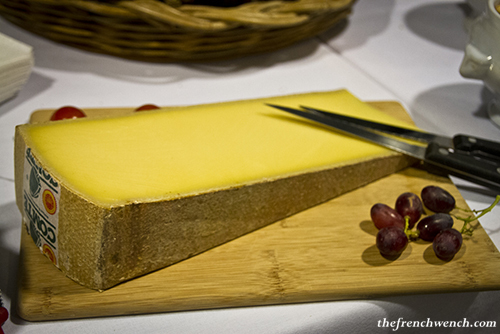 What they do is Reblochon Fermier, with the milk of their own animals that are on the farm. There are lot of industrial copies, and it’s true that a lot of people are going to buy it. But the fermier will stay, there will always be a number of people dedicated enough, even improving the technique and the quality of those cheeses, and I think it will stay because the French people love it. FW: Are there any restaurants in France where you like to go back every year? GG: There are lots of restaurants that I wish I’d visited! Sometimes we go back to places, but we don’t often go back to top restaurants, because it’s expensive. There are restaurants where you have to go once in your lifetime, like Paul Bocuse, three-star restaurants. But where we like to go is brasseries, where you have a really French atmosphere, where we are relaxed. I almost always go to Le Grand Colbert in Paris, it’s a beautiful decor, it’s 100 years old, there are mirrors, leather banquettes, ceramics, it’s just a very Parisian atmosphere. I love to go to Bofinger… But when I go to France, I don’t stay there long, so I tend to try new places and new regions. Australia is very good, that’s where I live, but France is great. How can you not want to go back and spend time in France? I suppose that depends on your personality, but those people that put France down, I think they are whingers. FW: Which team do you root for in sports in general, and on Le Tour in particular? GG: Depends on the sports: for soccer I tend to go for the French, because you don’t always need to know the players that well. France has been so much better than Australia in the past, so it’s nice to be French. But with cycling, with the Tour de France for example, I met Cadel Evans privately, I have met Simon Gerrans, 10 years ago when he was a young rider, he had won nothing at all, except that he was a good rider… So at the moment, I’m a bit fond of the Australians, but if a French rider wins a stage, I’m absolutely thrilled, I’m really happy. “Taste le Tour” shows on SBS every night around 10pm until July 21st and can be found online on SBS website. 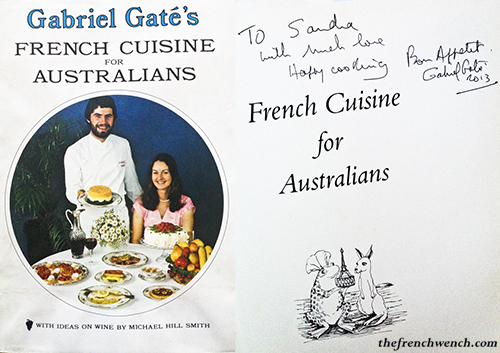 This entry was posted in Events, French Specialties, Interview, Travel and tagged Gabriel Gate, Taste le Tour, Tour de France. Bookmark the permalink. Fantastic blog….any words on the 2014 tour tastings….I love Gabrielle’s cooking. Thank you french wench.